Hi, I have never got a response in this section but hey what the heck why not try again lol. 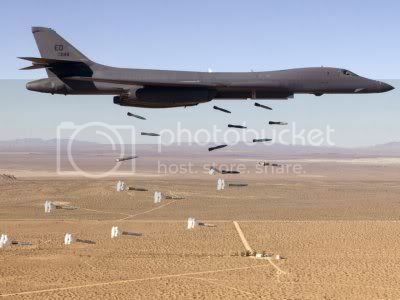 Im wondering if anyone would be up to modeling a B1 bomber for me, that carpet bombs and has the wings that fold back in full flight. Its a big request yes and if someone things they can do it that would be tremendous. Now if no one is up to doing the request I will attempt it myself even thou I have 0 experience with modeling lol, I have the newest version of 3DSMAX and am wondering if that will do or do I need to have a older version in order for it to work with the plugins ? Honestly, I doubt anyone will do this. Modeling a full-fledged aircraft is a huge task. Modeling a hand weapon is large task. Modeling a tank is a big fat task. Modeling an aircraft is about the most difficult thing to do. Especially if coding, animating etc. come with it. It usually takes several months to complete a simple fighter. Bombers are more long-term. You can try yourself, but don't expect any miracles. It takes insane amounts of time and will to learn and gather experience so you can actually deliver some good-looking results. And I'm talking about basic models. Until you can create good-looking complex models like aircraft that also have a good and low polycount you will start over dozens of times. And be frustrated. A lot. And only then you get your reward. Well thanks for the double post of support , So since it looks like I will attempt this on my own, what version of 3DSMAX would be recommended ? Max 5,6,7 have full support of the BFMDT tools. Max 8,9 can use the tools with a workaround and with some drawbacks (vehicle tool often screws up, the rest like standardmeshes etc. work fine, though). Max 10,11,12 can't use the tools at all. If you only model for BF42, it's the safest bet. I work on BF42 and newer engines, but luckily Max7 and Max12 coexist quite peacefully . And in retrospect I see my first post might appear a bit rude in its harshness. I just wanted to be sincere and not raise any false hopes of "hey, I'll just model a super complex high detail bomber in the next two hours!". Modeling high-detail models is one thing (that's actually the easy part), modeling high-detail models with low polycount (so the engine doesn't get bogged) is the actual masterpiece everyone has to accomplish. No I never took your post as harse , I was just ribbing you cause your browser posted it twice lol, but ya it was a straight up post that you made and I like straight answers . The poly count your referring to is what can cause a very laggy experience if you get to close to it in game right. Well thanks for the tips on the poly count and I will keep that in mind when I attempt it. You can still go relatively high-poly, as long as you use good LODs. For HD models in BG42 some of the modelers manually created the first two or three LODs, making them far better-looking than the automatically generated ones (Which are okay as well), but allowed us to move up the LOD switching distance. Meaning: If you are very close to the vehicle you would see the uber-detail-fancy version. Move a bit away and the smallest details are gone, but you wouldn't notice that as much anyway from even a short distance. And even those few details usually make out A LOT of polys. That continues until you only see a crude 100poly-box from far away . The disadvantage of LODs is that the engine has to load them simultaneously so it can switch instantly between them, but that was a problem back in 2003, not today with the huge amount of VRAM available on average graphic cards. Ya I have a basic understanding of LOD's and what there used for, The DCX MI24SE that I imported into my dustbowl mod has a issue where there are times some of us can see it at distance and other times its just invisable at medium range , seems random too lol. I didnt realize thou that each LOD was individually created as you mentioned, I thought the game just auto dialed down the detail the further you were from the object. But doing some thinking I dont think that making a B1 bomber for my first 3DSMAX project is wise as I would prob just get frustrated and never attempt it again, and besides this game will prob be empty by the time I would finish making it lol. A good buddy that I game with on DC use to work on the B1 when he was in the Airforce so I was gonna try surprise him with one, maybe I will just make him a static toolbox in the hangar lol. Starting with modeling for BF42 is not actually a bad idea, because the limitation on polys and details also means you will require less time for it. Models for BF2 (which looks "bad" for todays standards as well) take at least quadruple the amount of time than BF42 models. If you want to hone your skills for future games, though, I'd suggest you learn modeling for the Unreal engine. That one is very compatible, easy to use and is very likely to remain a state-of-the-art-engine. Also, it allows for about every texture trickery there is in the books (normal, spec, bump, etc. maps). With this trickery even low-poly models easily can look fantastic. Of course you'd need to know texturing for that .